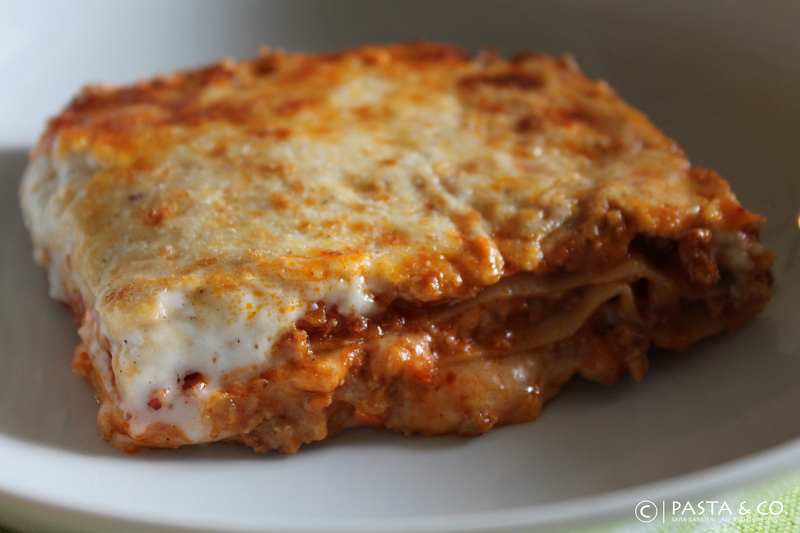 Is there a secret to a great lasagna? | Pasta & Co. Among the most famous Italian classics, Lasagna (or plural, lasagne) originated in Emilia Romagna, in the city of Bologna, the PARADISE of fresh pasta. Emilia Romagna is home to many of Italy’s most renowned specialties: Prosciutto di Parma, Mortadella, Parmigiano Reggiano, Cotechino and Aceto Balsamico di Modena, just to name a few. Now, about secrets. 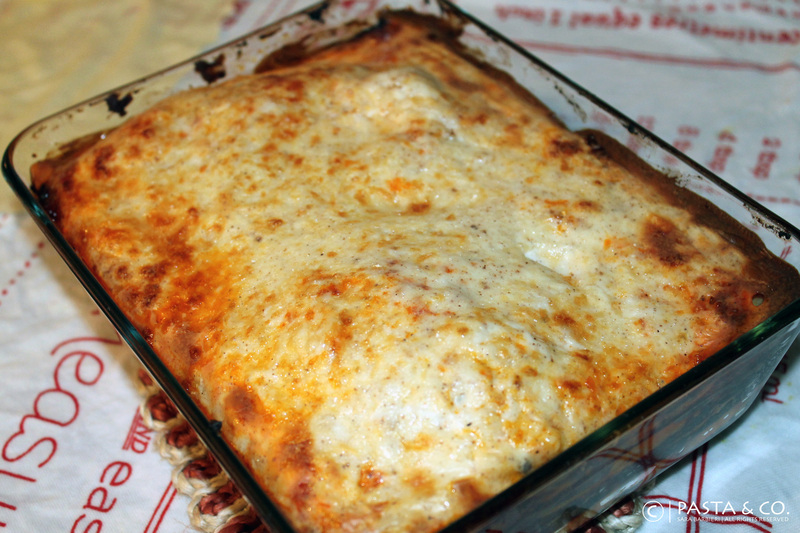 There is this school of thought (whose thoughts, btw, I share) that insists on Lasagna being made with béchamel, Ragu alla bolognese (Bolognese meat sauce) and Parmigiano Reggiano. No ricotta cheese, no mozzarella, no other cheeses – maybe you can add a layer of a good Prosciutto Cotto (ham; Parmacotto is from Emilia Romagna too!) if you want to give it a twist. So, first secret: the right ingredients. Secondly, the method. Ragù, the glorious Italian meat sauce (which does NOT have anything, anything to do with the packaged American Ragu brand), has to start off with a hearty soffritto; it must feature a mix of grass-fed beef and pork ground meat; and cook over looooow heat for at least 1 hour and 1/2. Béchamel sauce must be smooth and creamy, not too thick – otherwise you won’t be able to spread it evenly. If I had to choose between thick and more liquid, I would still say more liquid. Fresh (or packaged) lasagna sheets need to be paper-thin and cook a few seconds in salted boiling water, be drained and placed on a wet hand-towel to lose extra water. All this being said, you can use ricotta, mozzarella, spinach-based green pasta, veggies and what you prefer and want. What I’ll show you here is the Lasagna alla Bolognese. It’s my favorite, because it’s hearty (but not heavy, nonetheless), and it lets fresh pasta really shine. 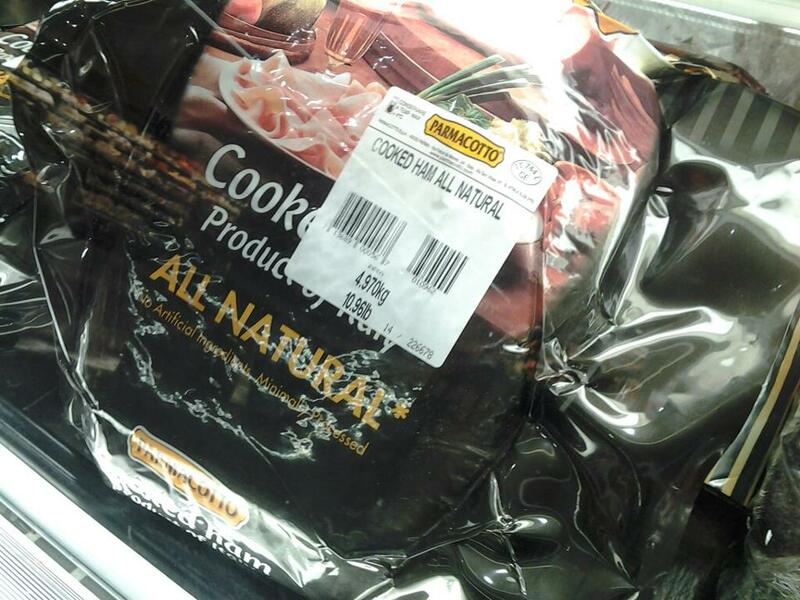 For lasagna to be called lasagna, this needs to have pasta sheets, a layering process and baking. Please share your recipes and let’s get to the burners! B) Knead fresh pasta as shown in my recent post How to make fresh pasta from scratch. Make sure your sheets fit the baker you plan to use. C) Prepare the béchamel sauce. Scald the milk. Meanwhile, melt the butter in a saucepan over low heat. Next, whisk in the flour and stir continuously for 5 minutes. Pour the hot milk into the saucepan and whisk constantly so that you can work out the lumps. Increase the heat to medium and stir until you get a smooth, thick sauce. Add grated Parmigiano, nutmeg and salt to taste. Put it aside. 2) Cook pasta in salted boiling water for a few seconds. Drain and place the sheets on a clean hand-towel. 3) Take your oven-to-table baker. Start with two tbsp of ragù. This will avoid burning. Begin to layer pasta, meat sauce, béchamel, and grated Parmigiano. Repeat this process until you have completely filled the baker. Finally, coat with béchamel and generously sprinkle with grated Parmigiano on top. 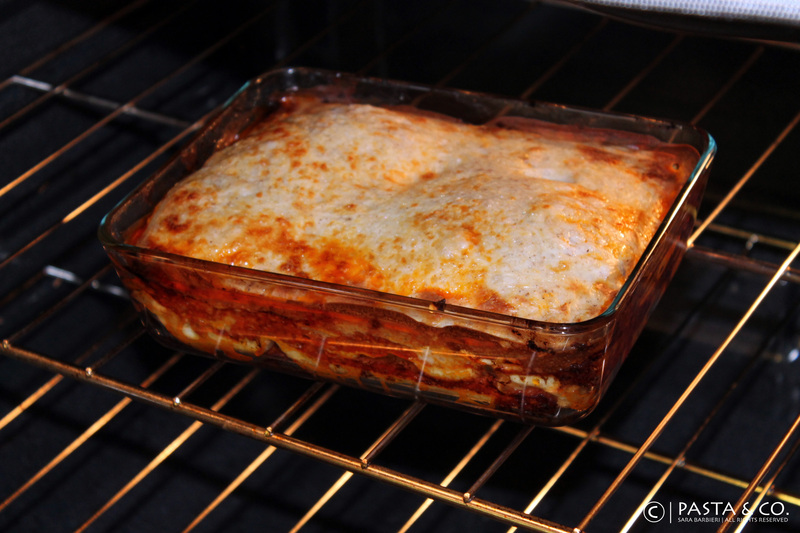 4) Bake lasagna until you see a golden crusty gratin (about 30 min). 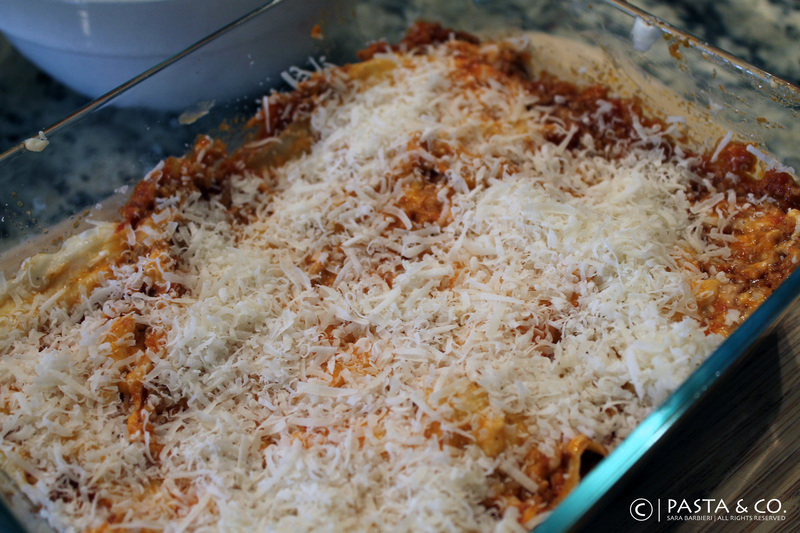 5) Remove from the oven, wait about five to ten minutes for the pasta to cool down. Use a lasagna lifter or a turner to plate up and enjoy!